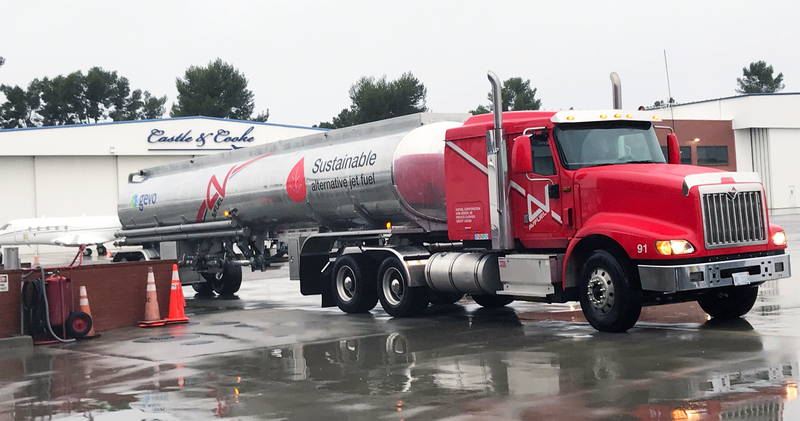 Avfuel has supplied its first full truckload delivery of sustainable alternative jet fuel (SAJF), a milestone for the fuel supplier’s ongoing SAJF initiatives. Avfuel supplied the fuel in support of the Business Jets Fuel Green: A Step Toward Sustainability event at Van Nuys Airport (KVNY). As part of the event, operators flying in to Van Nuys’ Castle & Cooke Aviation and Signature Flight Support FBOs were able to purchase Avfuel’s new SAJF product, helping to reduce carbon emissions. Avfuel supplied the SAJF in partnership with Gevo, which produces the concentrated SAJF product. Avfuel then blended the concentrated SAJF product with petroleum-based jet fuel and tested the fuel for quality and to ensure it met ASTM D1655 standards. For every million gallons of SAJF Gevo produces, approximately 20,000,000 lb of animal feed and protein is produced and sold into the food chain. Avfuel entered an agreement with Gevo in July 2018 to be its exclusive fuel supplier. The full load at the Van Nuys event is the first fruits of this partnership.